Finally it starting to feel like spring. The grass is green and you can see actual buds on the trees. The bird feeder has been full of birds for two weeks now. We even had a blanket out in the yard last weekend for reading and doing homework and getting some very much missed sun. My daughter's best friend had braces and now she is getting glasses. Em is beside herself because she wants glasses and braces...isn't it funny that the things that are nearly perfect on her she isn't happy with?? I tried to explain that to her, but no...I told her to get fake glasses..that was dumb! Still reading Extremely close and Incredibly Loud. I left if for awhile, it is such a cool book, I love the way it is written. If you have the chance you should really try it out I think you will be amazed. Seriously, go get it now. I need to clean up this site it looks a bit messy! did you take that photo?!! 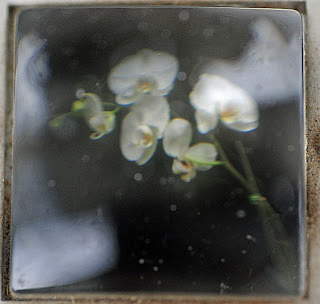 Yep, I tried out my brownie camera and the macro lens. I t was fun. I only did a couple of pics and this is the one that looked the best. I need to try it again, it was fun. I loved Extremely Close and Incredibly Loud! Have you read Everything Is Illuminated? happy mothers day to you too! it sounds like you're an absolutely wonderful mother. what's better than a child's love : ) i'm lovin this photo!